If you are a regular at Westfield Chermside Shopping Centre you can now enjoy our value packed LEDlounge memberships to illuminate your complexion and restore the youthful skin health you crave. All it takes is 2 – 3 short 20 min sessions of LED per week to see the long term benefits emerge before your very eyes. Light therapies improve your mood. The best results come from regular visits as accumulation of LED exposure will speed up your desired results. Our LEDlounge membership packages offer affordable results for those who can visit our Westfield Chermside skin clinic up to 3 times per week. The quick, gentle and easy way to flawless looking skin. We cleanse your skin, set your 15 min LED treatment & apply a tinted BB cream as you leave. For anyone who just wants to try the membership out for a month. *Up to 3 LEDexpress sessions per week. For individuals only. Memberships are not transferable to other people and are not transferable for cash. Results may vary from person to person. Terms & conditions apply to all LEDlounge memberships. A new dawn awaits blotchy, pigmented skin. In this facial Melasma, dyschromia, sun spots & surface pigmentation is brightened & clarified with fruit acids, dermal boosters and melanin balancing LED light therapy to reveal a fresher, clearer & more radiant skin. The ultimate party glow facial & a favourite with our Soho VIP’s. Your skin will come to life with a bespoke multi-layered cocktail of buffing, peeling, collagen booster infusing, LED light therapy & spa massage restoration. The final result is your skin glows with a renewed light & vigor, as if from within & lasts for weeks. Recommended by Weekend Notes. Soho’s non-blood version of the Vampire Facial. An ultra refining, re-texturizing medispa facial treatment combining collagen induction therapy, epidermal growth factor stem cell infusion & a soothing clinical peptide masque treatment under LED to achieve a smooth, refined and luminous complexion. Perfect for correcting skins with large pores, pitted or raised acne scarring, coarse skin texture, sun damage, fine lines and wrinkles. Is LED a painful procedure? No, not at all. In fact you will only feel a little warmth from the light diodes over your skin. It is the most relaxing medi treatment you could possibly have. Is LED good for my Eczema? Yes, we get exceptional results with LED when our patients are on an LED membership and have 3 treatments a week for either 1 or 2 months depending on the severity of the condition. I am allergic to all skincare products, can I have LED? Yes. 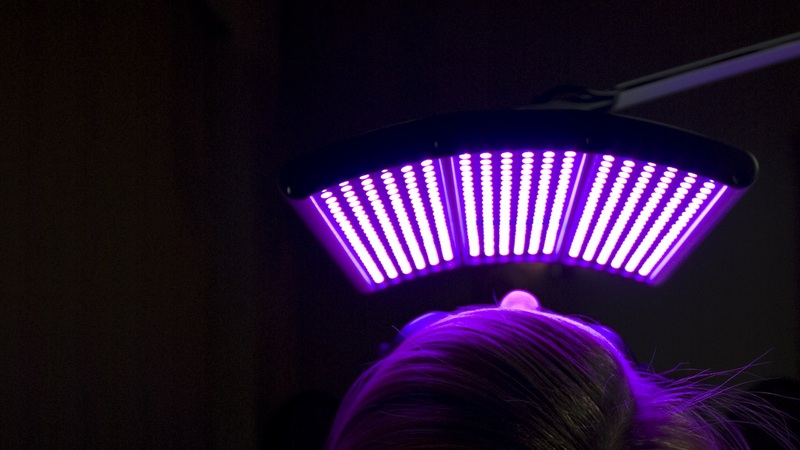 LED may be the only clinic treatment you can have as the repair and rebalancing is done by the light and not skincare products. Will I still get results if I have an LED treatment with my monthly facial? Yes. Peels and microdermabrasion remove surface debris and increase circulation to the skin but do not affect the dermal layer of the skin that produces collagen, elastin and hyaluronic acid. So adding LED to you peel or microdermabrasion will in effect take your facial from the surface to the dermis meaning your skin will look better in a month than it does today. I am a local, what are the benefits of being on an LED membership? Accumulation. The more often you have LED the quicker and better the results. By attending the clinic for 3 x LED sessions a week you dramatically speed up the skins anti aging and repair processes to reveal fresher, younger looking skin in as little as 3 weeks. The best last minute high school reunion anti aging pill.